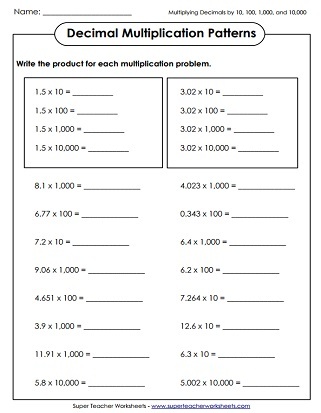 Use these worksheets to practice multiplying decimal factors together. The worksheets on this page align with the Common Core Standards. To view the CCSS alignment for any worksheet, please click on the common core icon below the worksheet's description. This worksheet has 10 vertical problems and 2 word problems that students can solve to practice multiplying decimals by single digit numbers. This worksheet has word problems to solve multiplying decimals by single digit numbers. Find products by multiplying the numbers inside the shapes. Solve each word problem by multiplying decimals to the tenths and hundredths place by single digit numbers. Multiply each decimal by a one-digit number. (example: 18.7 x 6) This worksheet requires students to rewrite each problem vertically to solve. Using this set of task cards, students will practice multiplying decimals to tenths and hundredths by single digit numbers. Multiply each two digit number by decimals to the tenths and hundredths place. Use these task cards to practice multiplying decimals by 10, 100 or 1,000. The problems on this page were not solved correctly. Find the mistakes and explain how solve the problems correctly. This page has ten vertical problems and one word problem. 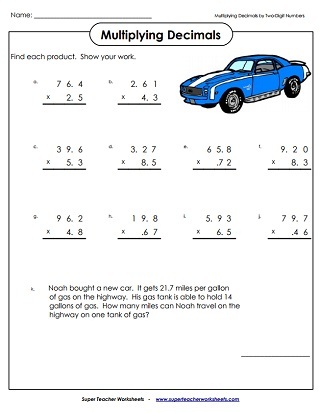 Students will solve decimal by 2-digit number multiplication word problems on this worksheet. Decide whether you need to multiply or divide to solve these decimal word problems. Multiply decimals by 1 and 2-digit numbers. (examples: 3.4 x 4 and 1.35 x 5.5) Includes 8 vertical problems and 2 word problems. Multiply the decimals inside the shapes to find the product. These multiplication problems were not solved correctly. Find the mistakes, solve them correctly, and explain your thinking. Multiply decimals by 2-Digit numbers. (example. 82 x 0.65) This worksheet requires students to rewrite problems vertically. Students will use decimal multiplication to calculate their weight on all eight planets in the solar system. Find the products by multiplying decimals by 10, 100 and 1,000. Students will find the missing factor or product for each decimal multiplication problem. This page has lots of worksheets for teaching decimal division. Add and subtract pairs of decimal numbers.